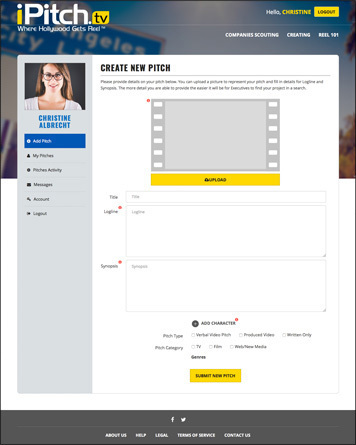 AS A SUBSCRIBING CREATOR AT IPITCH YOU CAN USE THE “ADD PITCH” PAGE TO CREATE ADDITIONAL PITCHES FOR OUR INDUSTRY EXECUTIVE MEMBERS’ CONSIDERATION. MAKE YOUR PITCH STAND OUT IN AN EXECUTIVE SEARCH BY ADDING PICTURES AND VIDEO TO REPRESENT YOUR PITCH. ADD CHARACTER PROFILES WHERE APPLICABLE WITH PHOTOS AND WRITTEN DESCRIPTIONS, AS WELL AS DETAILS FOR LOGLINE AND SYNOPSIS. EXECUTIVES WILL ALSO SCOUT YOUR PROJECT BY ANY COMBINATION OF CATEGORY TYPES AND GENRES.